The People's Republic of China is celebrating its 56th birthday. 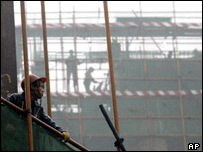 Now a country of dazzling economic growth, capitalism appears to have found a way of co-habiting with communism, but who actually runs China today? Who runs China? That, as the Americans like to say, is a bit of a "no-brainer". The Communist Party of course! Fifty-six years to the day since Mao Zedong stood on Tiananmen Square and declared the founding of New China, the communists' grip on power appears secure. Stroll down to Tiananmen Square today and you will still see Chairman Mao staring out from his huge portrait across the vast expanse of granite. In its middle stands his huge mausoleum. Every morning thousands of people from all over China queue up to file past his preserved corpse. A stone's throw away on the north east corner of the square, another mammoth granite edifice is close to completion. It is the new Ministry of State Security, China's KGB. The communists, it seems, are going nowhere. But change the question a bit and you get a very different answer. Who runs the lives of China's 1.3 billion people? 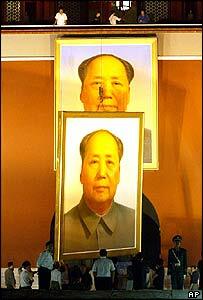 In Mao's day the answer was the same: the Communist Party. 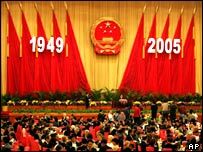 From the land reform and the bloody purges of the 1950s, through the disasters of the great leap forward and the cultural revolution, the lives of hundreds of millions of Chinese were directly controlled, and often destroyed, on the orders of the Communist Party. Even thoughts were no longer private. Today, China is a very different place. The Party has withdrawn from people's heads, from their homes, and by and large from their work places. No more endless struggle sessions, no more self-criticisms. Today Chinese people are by and large free to think, and to do, as they please. Take the story of Mr Wang for example. He is one of China's new rich. In the days of Mao, Mr Wang would have been condemned as a capitalist and sent to a labour camp. Today he not only controls a huge private fortune, he is no longer afraid to flaunt it. Half an hour outside Beijing, amid the corn fields and poplar trees, stands Mr Wang's latest, and most extravagant creation: a full scale replica of a baroque French chateau. Every single piece of stone has been imported from France at a cost of £50m ($90m). Beneath the castle, in its stone-arched cellar, Mr Wang has laid down thousands of bottles of wine, many also imported from France. On the cellar wall hangs a large photograph of Mr Wang sampling one of the bottles from his collection with the number four from China's all-powerful Politburo. Mr Wang is not just a friend of the Party, he is a member of it. If you want to understand who runs China today you have to understand the meaning of the word "guanxi". Literally translated, guanxi means connections. But it is much more than having the same old school tie. In Europe or America who you know might help you get a job, or get your child into a decent school. In China who you have guanxi with can mean the difference between freedom and jail, justice or discrimination, wealth or poverty. Mr Wang has serious guanxi. But for those without guanxi life is very different. Every year tens of thousands of people get on trains and buses from all over China to make the long trek to Beijing. They do not come to see Mao's mausoleum. They come to petition the government for justice. All have terrible tales of woe. Some have had their land stolen for development, others have had their husbands or sons beaten senseless by the police. All have tried and failed to get justice in their home towns and villages. Coming to Beijing is their last hope. Each morning they form a long snaking queue outside the petitions office. They wait patiently for hours. Finally when their turn comes, they hand their documents through a small window. Time and time again these innocents from China's countryside will tell you that if only the central government gets to hear about their case, justice will be done. These people have no guanxi. They are just part of China's seething mass. Their cases will not get heard. As it prepared to mark its 56th birthday this week, China's rulers sent police out into the slums south of Beijing to round up thousands of these petitioners and ship them back to their far-away homes. Political trouble-makers have been rounded up too. I have a friend who lost his left leg to a soldier's bullet during the Tiananmen massacre in 1989. Mr Qi's problem is he still has not learned to shut his mouth. Sixteen years after the massacre he still refuses to stop demanding justice. Three nights ago, four men broke in to Mr Qi's house and beat him senseless. As they punched his ribs till they cracked, they repeated the same words over and over: "Stop making trouble, stop making trouble." No-one is being allowed to mar the birthday celebrations of the People's Republic of China. From Our Own Correspondent was broadcast on Saturday, 1 October, 2005 at 1130 BST on BBC Radio 4. Please check the programme schedules for World Service transmission times.